Let us not only give prayers of thanks for those who have served their countries but also prayers of hope that we may some day live in a world of peace, inspired by the love found in the Sacred Heart of Jesus. Veterans Day took on a special meaning this year not only for Americans, but for people around the world as they commemorated the 100th anniversary of the end of World War I. The fighting stopped on the 11th hour of the 11th day of the 11th month in 1918. It was a war that impacted the Priests of the Sacred Heart significantly. Thirty-three Dehonians (including seminarians) lost their lives; many others were injured. The congregation itself faced great hardship in Europe during the war years. On November 26 the congregation commemorates “Dehonian Memorial Day.” Several materials (primarily in Italian) have been prepared to remember in a special way those impacted by WWI. They include photos of SCJs who died in the war, and of SCJ ministries damaged in the bombing. Click here to access the materials on the congregational website. Fr. Greg Schill, SCJ, a veteran himself (US Marine Corps), is pictured at the top of the page blessing fellow veterans during a special Mass at Sacred Heart School in Southaven, MS. The online North American Personnel Directory and the Necrology were updated last week. Also, an updated PDF of the printed North American directory is available for download at the top of the online directory page (it is dated November 9, 2018). Save the PDF for use in your computer or mobile device. It can be stored and opened in apps such as iBooks or Kindle. Reminder: the online directory is password-protected. If you need assistance in accessing the directory, contact Mary Gorski at the Provincial Offices (414-427-4266). Tomorrow, November 13, is the Feast Day of Mother Frances Cabrini, MSC, patron saint of immigrants and migrants. Jesus, together with Mary and Joseph, you were forced to flee the persecution of Herod. You continue to unite yourself with all those forced to flee their homes and live in exile. Today, we entrust to your loving care all women, children and men who live as migrants. may experience SOLIDARITY and HOPE. in the asylum seeker imprisoned for fleeing without documents. find in us a home where all are welcomed. for the coming of a new humanity in Jesus Christ” (Cst. #38). United with Mother Cabrini, we ask this in your name, Jesus. Amen. Members of the Migration Committee ask that you not only pray for immigrants and migrants, but take action. Click here to send an electronic postcard to U.S. Senators and Representatives asking that they pass just and compassionate immigration reform legislation in the 113th Congress. As noted last week, during the month of November, Dehonian Spirituality, the weekly e-publication produced by the Dehonian Associates Office, is featuring reflections on North American SCJs who are now deceased. Last Friday’s was written by Br. Brian Tompkins, SCJ, reflecting on Fr. Joseph “George” Coppens, SCJ. “I first met Fr. George, as he was always called, in 2004 when I was an SCJ candidate,” wrote Br. Brian. “He was in Toronto visiting. At the time, he was pastor of Sacred Heart Parish in Uxbridge, Ontario. “The first thing I noticed about Fr. George was that he was reading a novel. And during the years I got to know him best, between 2007-2012, I often saw him reading: a novel, the newspaper, his breviary, human interest stories, and medical articles that often covered his personal health concerns. Fr. George read and did not skim over anything; he was interested in everything. I recall when the new Roman Missal was published a he read and studied the changes. He wanted to be prepared and celebrate the Mass well. “Having lived in Toronto, I got to know Fr. George during his retirement. He was generally a quiet person yet often we had lunch together and it was during those times that his experiences as a pastor and educator were revealed. He animated the conversation with his intelligence, insight, and humor. “When I had that privilege of sharing daily life with this wonderful priest and person, I saw his love of the local wildlife, his care for his fish, for his health [George walked daily], and his love of life as a religious. Click here to read the November 9 issue of Dehonian Spirituality. Click here to subscribe. On Saturday, November 10, Fr. 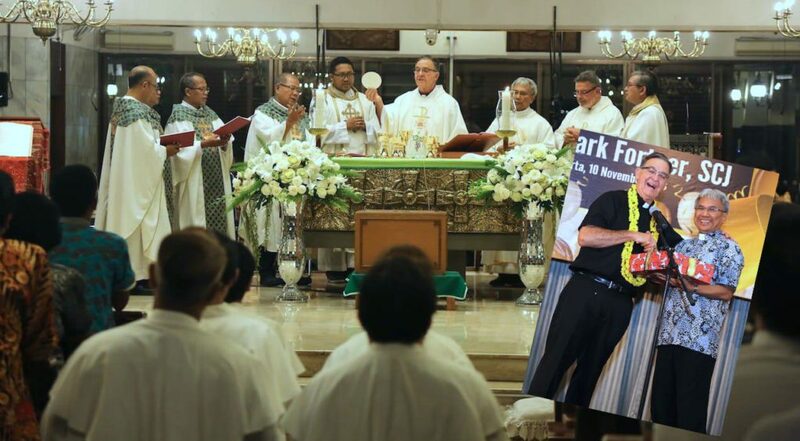 Mark Fortner, SCJ, returned to St. Stephan’s parish in Jakarta, Indonesia, a parish he founded in 1977. He is pictured above concelebrating a 50th anniversary Mass (of ordination) with fellow SCJs. In the photo on inset, Fr. Mark is pictured with the current pastor of St. Stephen’s, Fr. Thomas Suratno, SCJ. On Thursday, November 15, Sacred Heart Seminary and School of Theology will host Fr. James Kurzynski, astronomer and blogger for the Vatican Observatory Foundation and author of God’s Canvas: An Exploration of Faith, Astronomy and Creation. Fr. Kurzynski, a priest of the Diocese of La Crosse, is this year’s presenter at the 2018 Gold Vespers held on the Memorial of St. Albert the Great, patron saint of scientists. The evening begins with Solemn Vespers at 5:05 p.m. followed by a reception in the SHSST lobby. The lecture begins at 5:50 p.m. and will conclude with a question and answer session. If you are interested in attending, please RSVP to Dr. Paul Monson at pmonson@shsst.edu. The program is sponsored by a Science for Seminaries Grant from the American Association for the Advancement of Science. 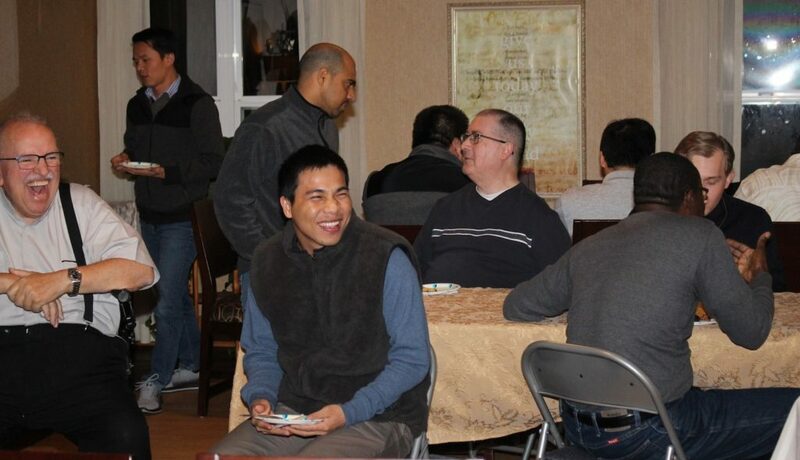 Members of the St. Joseph’s Community on the fourth floor of Sacred Heart at Monastery Lake welcomed SCJs and students for a pre-holiday party last Thursday. Our thanks to Br. Frank Presto, SCJ, for capturing a few photos of the celebration.